France's hopes of qualifying for the first ever FIBA U17 World Championship quarter-finals have been kept alive after winning their third match after beating Russia (56-53). Although leading most of the time, Russia always remained on their tail. The second day had ended in disappointment for France as they allowed Turkey to come from behind in the last quarter to win (54-51). The top scorers for the first three matches for France are Olivia Epoupa (left), Christelle Diallo and Margaux Galliou-Loko with 8.7, 8.3 and 7.3 ppg. On the rebounding side Diallo and Galliou-Loko have taken 4.3 rpg while Lola De Angelis pulled down 4. 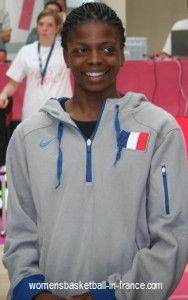 In the assist ranking Epoupa had 2 before Laure Mercier and Esther Niamke with 1.3 apg apiece.Epoupa is the youngest member in the French U17 team and is a product of Paris Basket 18. For Australia always present is Gretel Tippet while USA have two more top scorers with Elizabeth Williams and Kaleena Lewis. Diallo was outscoring their opponents on day 3 for France while Belgium's Emma Meeseman out-rebounded their opponents on day 3. Meng Li has been top scoring for China twice following the example of Hongyang Cui who was the highest scorer on day 1 against Argentina. Mali are continuing their international basketball apprenticeship and improve game by game.